Departure was 7:00 am. We didn't know it, but compared to the days to come, this was a relatively late departure. Perhaps they didn't want to frighten us too early in the tour 😉. We headed down Arnhem Highway pausing to look at some magnetic termite mounds then, a little later, stopped for refreshments at Corroboree Park Tavern, a truck stop where we saw a 60 metre road train and a six metre salt water crocodile. His name is Brutus and he lives in a cage. Near Jabiru, we stopped at the Bowali Visitor Centre designed by Troppo Architects. Its long linear design is inspired by an Aboriginal Rock Shelter and has received many design awards. A large protective roof sails across the many exhibition spaces which are open to the air. Visitors to this part of the world should stop here as the centre contains a wealth of information about Kakadu. We crossed into Kakadu National Park and proceeded on to Jabiru where we enjoyed lunch in a park by the side of lake Jabiru. There we had our first lecture about the dangers of Saltwater Crocodiles, the way they can conceal themselves and the speed with which they can move from the water to an unsuspecting human. We kept well back from the water's edge. We then headed towards the sacred Ubirr rock art site site near the East Alligator River where some of Kakadu’s most important ancestral figures are depicted. 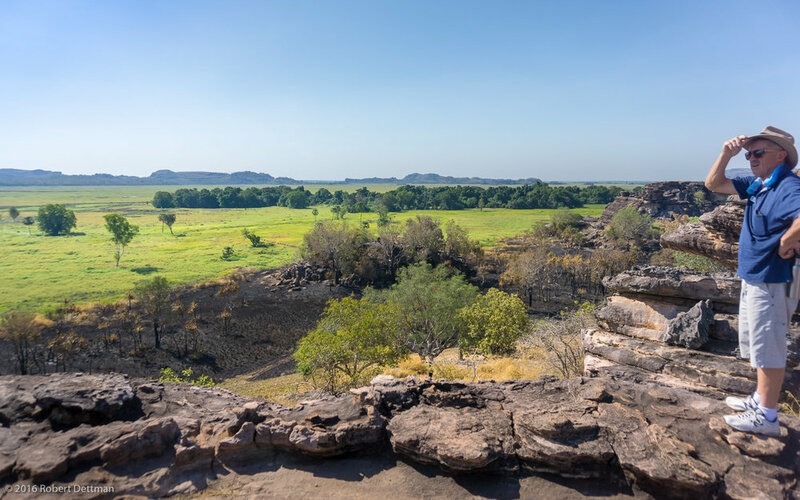 The traditional owners camped beneath Ubirr’s cool rocky shelters and used the plants and animals of the nearby floodplain and East Alligator River for food, tools and medicine. The smooth stone surfaces were perfect for making painted records of their lives. A "native" person surveys his domain from the edge of the rock shelter. The elevated location provides magnificent views over the flood plain to the west. Much of the art features fish, turtles, goanna and other important food animals. A painting of a thylacine, the Tasmanian tiger, which became extinct on the mainland at least two thousand years ago, gives an idea of the age of some of this art. Luke explains that these rock faces have been painted and repainted since 40,000 years ago with most painted 2,000 years ago. This is the iconic painting of a male warrior (how do they know?) with spear thrower, spears and dilly bag. Xray style of painting showing details of internal structure. It is common to see paintings overlaid one on the other. Dating techniques indicates that these have been added over large spans of time. Some of Ubirr's Stone Age art is thought to date to the Paleolithic era, as far back as 30,000 BCE or even earlier. The art is considered among the best in the world, with fine examples of x-ray painting as well as contact art from the time when Indigenous people first encountered Europeans. Luke describing the beauty of the elevated Ubirr shelter which looks out over the flood plains. The rock shelters moderated the climate by retaining the heat from the day and releasing warmth during the night. During the day the rocks were cool and provided a shady community space. It is difficult to comprehend the age of the Ubirr site as a human habitation, let alone the people who lived here during the last ice age when the climate was so different and hostile to life. This link describes what it was like and how the people coped. With the melting of ice caps at the end of the last ice age sea level rise moved the coastline hundreds of kilometres inland. Oral stories that have persisted for at least 10,000 years tell of sea level rise. This link describes evidence that these tales are true. The Rainbow Serpent gallery is the most sacred site at Ubirr, and is for the traditional owners, a women-only site. The site was said to have been visited in the dream-time by 'Garranga’rreli', the Rainbow Serpent. On this visit she sang, bringing the people, animals and plants into existence. This song line is still sacred to the Indigenous people of the region. There is more here. For us white fellas, or at least for this one, the whole concept of the Dreaming or Dreamtime is a mystery. But the following quotations taken from the website aboriginalart.com.au helps clarify it. The Dreaming refers to all that is known and all that is understood. It is the way Aboriginal people explain life and how their world came into being. It is central to the existence of traditional Aboriginal people, their lifestyle and their culture, for it determines their values and beliefs and their relationship with every living creature and every feature of the landscape. Luke explains the legend of the Rainbow Serpent. The Wagilag story of Central Arnhem Land concerns a scared waterhole protected by the serpent Witiji who was angered by the Wagilag sisters when they sullied the water unknowingly. It reared its arched body into the sky forming a rainbow and causing cataclysmic weather conditions which created the waterways. The sisters danced furiously to appease Witiji but the rainbow serpent swallowed and regurgitated them repeatedly in a timeless saga of death and rebirth. The boom of its voice is still heard in the didjeridoo, its spit is seen as rain and its flicking tongue in lightning. Water is intimately connected with land ownership and custodianship laws as it is with Indigenous spirituality. In Arnhem Land and other areas where water sources are permanent and abundant, the law follows a clearly defined clan and descent-based system, whereas in desert regions where access to water is less predictable and seasonal, many other factors are relevant as where you were conceived, born, initiated and where kin passed away. Rock pools, waterholes and soakages are spiritual reservoirs. They hold the souls of the recently deceased and the spirit of the yet to be born which can enter the womb of a pregnant woman, thus defining the child’s spiritual connection to that site in perpetuity. Mining activity and other rescue interests contaminate waterholes and river systems and the values that sustain both the cultural and natural values of water sources continue to be threatened. This can only be averted if the integrity of Indigenous laws and practices is recognised in resource management and the administration of Native Title. Before going to our camp, we spent some time at Cahill Crossing, a ford on the East alligator River. The river is tidal at this point so at different times of the day there are variable depths of water flowing over the ford. Miss-judging the depth and strength of the flow can be disastrous as illustrated by the two vehicles in the water. Accommodation for the next two nights was at Hawk Dreaming Wilderness Lodge, at Cannon Hill. The area has considerable importance to the local Aboriginal people, in fact the whole of the Cannon Hill area is a registered sacred site. The sandstone outliers around Cannon Hill host significant ancient rock art. 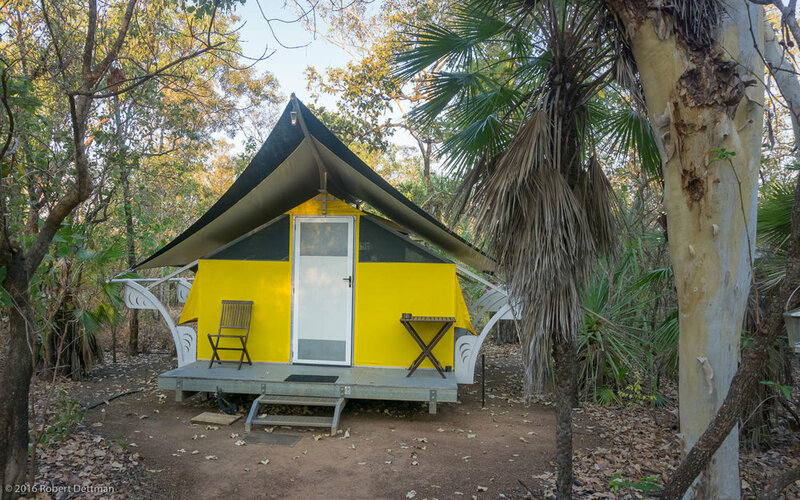 Hawk Dreaming Wilderness Lodge, our "home among the gum trees" for two nights.